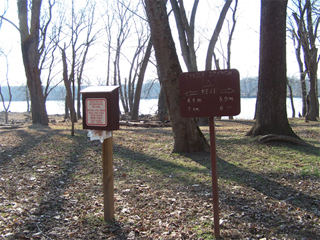 At canal milepost 30.5, the Chisel Branch Hiker Biker campsite is one of numerous facilities in the Chesapeake and Ohio Canal National Historical Park devoted to hike-in or bike-in camping. These facilities provide primitive campsites, drinking water, and toilets. Vehicle access is about 0.2 miles upstream at Edwards Ferry, canal mile 30.8.